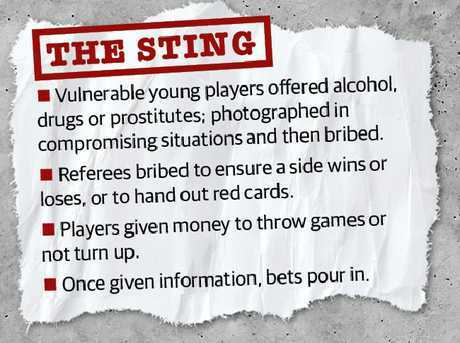 Some players have been blackmailed after being set up with prostitutes and secretly photographed. HIGH school-aged athletes are being bribed with alcohol, drugs and prostitutes by high-rolling criminal syndicates trying to fix matches and launder dirty cash. A high-powered Turnbull Government taskforce has been established in response. Criminals linked to Asian offshore betting markets are gambling hundreds of millions on Australian sport, including under-18 tennis, soccer and basketball. A yet-to-be-released sport integrity review by former NSW Judge James Wood QC has jolted the Government into setting up a super taskforce, which includes the Prime Minister and Cabinet, Treasury, Home Affairs, and the Attorney-General and Health departments. 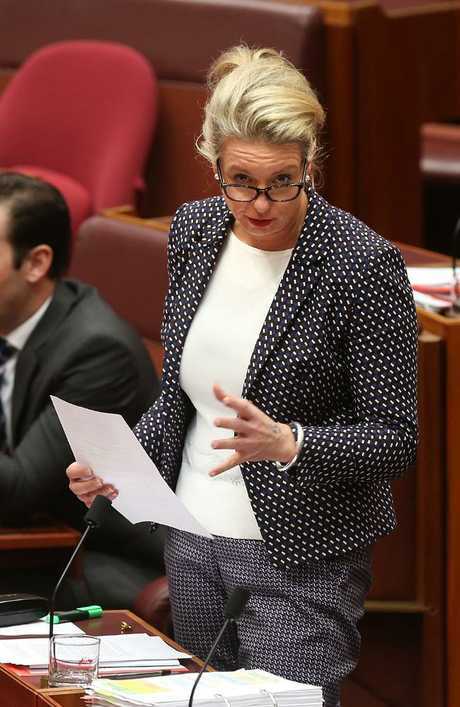 Sports Minister Bridget McKenzie said young players and non-professional competitions were being targeted by organised crime gangs. "The tennis circuit has players as young as 15 to 16. We've got junior football teams. It's not our elite athletes, although they are not immune,'' she said. "We're not talking about Serena Williams or Roger Federer succumbing to the overtures of some Mafioso crime boss. We're talking about quite low-level, typically young players. "When you have issues of corruption, typically you might take the vulnerable person or target out for dinner, wine and dine, maybe you dabble in some drugs, some sort of inappropriate behaviour, photos are taken and then you're in a blackmail situation. Or it might be simply monetary gain." It is understood some players have been blackmailed after being set up with prostitutes and secretly photographed. Coaches, referees and talent scouts can also be compromised. It is estimated that high-rollers, including those linked to syndicates, are betting more than $100,000 a year on offshore operations. Australians bet about $1 billion a year with unlicensed offshore operators. Senator McKenzie said there were three issues - liquid betting markets, organised crime and vulnerable players. The review by Justice Woods, which contains 52 recommendations, is expected to be released in August. It is likely to point to the problem of not having uniform wagering laws, which are primarily the responsibility of states, a plan to tackle money laundering and tax evasion and a need to protect vulnerable players. How crime gangs are targeting young Australian sport stars. The National Integrity of Sport noted that match fixing was not limited to professional or high-profile national sporting competitions and had occurred in lower grade competitions and in individual second and third tier events. Australian Criminal Intelligence Commission acting national manager of operational strategy Mick Allsopp said serious and organised crime entities might have access to, and control of, offshore wagering platforms. "Several international organised crime groups are direct owners of online bookmakers,'' Mr Allsopp said. "Multiple opportunities exist for domestic and international criminals to use online bookmakers to launder proceeds of crime and profit from the corruption of sporting and racing events. This includes the capacity to bet large amounts of money anonymously through offshore bookmakers. "Bookmakers operating online wagering platforms are increasingly basing their operations in jurisdictions where regulation and oversight of gambling activities ranges from minimal to completely absent." A Home Affairs Department spokesman said it recognised the importance of national sports integrity arrangements, especially in relation to illicit sports-wagering and links to criminality. The Football Federation Australia, asked about concerns of offshore wagers on low-level or junior (high-school aged or young adult) matches, said in a statement: "Like all sports organisations, FFA understands the potential for offshore wagers on matches in this country as these are impossible to control. Therefore we take action in areas we can control to help mitigate the risk. "FFA has taken a range of steps to reduce the risk of players being groomed and illegal betting in general. We provide guidance to players through our member federations and clubs, we conduct face-to-face education sessions with professional clubs and we work with Sportradar to monitor betting on football matches in Australia." Monitoring looks for unusual betting patterns which could indicate matching fixing. The FFA said it worked with the federal police " on a regular basis"